Europe's mock Mars rover "Bridget" during its trial in the Atacama Desert in Chile in October 2013. 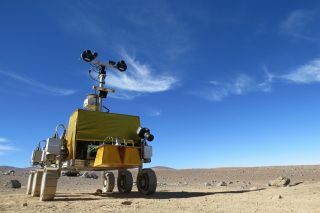 A disruptive dust devil did not stop a European Mars rover prototype from finishing its work in the Chilean desert recently, though the wind storm did force researchers to take shelter as it carried away a chair from the nearby remote control center. "Luckily [due] to the well-built camp and layout taking strong winds into account (using cars as windbreak), the emergency recovery plan and risk assessments no one was injured. We have even found the missing chair," European Space Agency (ESA) officials wrote in an Oct. 7 blog post about the Mars rover test drive incident. For ESA, the field trial represented a vital opportunity to test Mars roving in the field. While NASA is used to steering Red Planet rovers — the agency has piloted four on Mars, with the 1-ton Curiosity rover being the most recent — ExoMars will be the first European one. It is expected to launch in 2018. ESA worked to make the mission as realistic as possible, although there were a few adjustments required. For example, controllers marked where Bridget stopped at the end of every work day, then pulled the rover off the site overnight until the next morning, when it would navigate back. Since Bridget's return left tracks in the sand, researchers would go out and sweep the desert of any traces of the rover's path. This was necessary because the remote control center (RCC) was practicing navigating by landmarks. The rover tracks would provide an extra location clue that would not be available on Mars. Before Bridget started work in the field, a drone was used to take an aerial shot, simulating a picture taken from orbit. This allowed scientists to narrow down the site where they wanted the rover to do its work. Then the rover got down to business. Controllers treated each Earth field day as two Martian days, or "sols," although a sol is slightly longer than an Earth day. Bridget also encountered physical obstacles during the field test. One day, a flat rock was unexpectedly turned up after Bridget's front wheel disturbed its spot in the sand. ESA cheerfully called the situation "useful food for thought for rover designers and operators" who would need to figure out how to get around such a rock on Mars. Researchers working under shelter during the SAFER trial in Chile's Atacama Desert in October 2013. Bridget carried three instruments on board, including a panoramic camera to take stereo 3D pictures, radar to probe underground and a close-up imager to look at the samples it picked up. Since the rover did not carry a drill, it would occasionally require a time-out for humans to do that work; this would of course not be possible when the ExoMars rover is on the Red Planet, ESA officials said. One major goal of the mission was to use Bridget's tools to find a sample site, ideally one with "outcrops of bedrock beside looser material," ESA said in a release posted before the mission started. Results from the trial are still being analyzed, but the SAFER blog noted the work itself "has been a fantastic learning experience for all involved." Of note, the rover did track down a layer starting at 2 feet (60 cm) of depth at its second drilling location, a find considered to be close to what would be available on Mars. "The work is far from over, the study team will continue analyzing data and publishing results, but for now the field trial part of the trial is over," the team added in a blog post on Oct. 15. "Both the Atacama team and RCC celebrates the end of the successful trials."